Warsaw in the autumn of 1937. War is coming soon. French and German spies engage in a life and death struggle. A new military attache, Colonel Jean-Francois Mercier, arrives at the French embassy. He is drawn into a world of abduction, betrayal and intrigue in the diplomatic salons and back streets of Warsaw. In this latest brooding, sophisticated period piece, “The Spies of Warsaw,” winter does not simply arrive. Instead, “out in the countryside, the first paw prints of wolves were seen near the villages.” It is late 1937 in Poland, and the atmosphere is charged with peril. The wolves are both metaphorical and real....As always, but with especially great efficacy in “The Spies of Warsaw,” Mr. Furst asks how life can go on in the face of encroaching menace...Mr. Furst, conjuring a web of Warsaw spies who constantly weigh patriotism against self-interest and anticipate one another’s sly strategies, is an incomparable expert at this game. Alan Furst writes elegant, atmospheric spy novels set in continental Europe in the 1930s and early '40s: He owns the pre-World War II period as completely as John le Carré owns the Cold War...The Spies of Warsaw's protagonist is Jean-Francois Mercier, a French military attaché to Poland and the latest in Furst's line of heroic, introspective, world-weary aristocrats...[Alan Furst says] Poland is a wildly dramatic and tragic story. It's just unbelievable what went on with those people. How they survive I don't really know. The Germans had a particular hatred for the Poles, they really considered them subhuman Slavs, and they were very brutal to them...historical novels are an escape. If they're done right, they take you to another time and place, completely away from whatever your daily toil is...there's a lot of resonance with contemporary politics with that 1930s period. It was a real battle between authoritarianism and liberal democracy. They really had it out, and a lot of people died. "The Spies of Warsaw"...paints a convincing portrait of Europe in 1937, told in part through the eyes of a French military attaché. 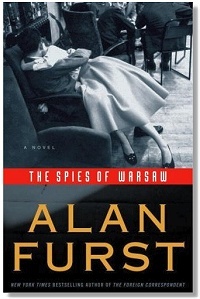 That Mr. Furst's book is atmospheric, convincing and filled with twists and turns will hardly surprise readers of his nine earlier spy books...[Alan Furst says] There were people in Poland who hid Jews in their houses, knowing it was a death sentence if they were caught. Heroic behavior is the refusal to compromise. My characters see the possibility of the occupation of their country, but they choose to stand up. That's the kind of people they are. This page was added on 10 June 2008. Updated on 29 September 2010.